You might be surprised to learn the huge impact placing numerous trash receptacles or cigarette urns on your property can make in effective litter prevention. According to a 2011 study conducted by Action Research, Inc. on littering behavior, the placement of trash receptacles in a space reduced the likelihood of littering. The presence of garbage encouraged further littering while the lack of garbage decreased its likelihood. By placing trash receptacles, cigarette urns, and pet waste dispensers on your property, you can encourage their use, and put a stop to littering on your property. Details are important in the development of commercial properties. You've taken care of the major items, picked out finishes, surfaces, and decorative schemes. Now it is time to work on the smaller, often overlooked design elements that can bring your whole area together. By placing tasteful and well-designed trash receptacles in conspicuous locations, you encourage users of your facility to keep the area clean, while not sacrificing the look and feel of your design. If you are dealing with an exterior area, we offer customizable options such as recycling containers and trash receptacles that can be paired with benches and picnic tables in the same style to create a cohesive look. Many of the trash can options we offer can be customized with your company, school or organization's logo and colors, and there are a wide variety of styles available. We offer options that can help you maintain the feel of a park or playground by blending tastefully into the surroundings. We also offer models that announce their presence in brushed steel or brightly painted hues. We have options that match a wide assortment of styles as well, with modern, classical, minimalist, and even naturalistic designs readily available — all to help in the prevention of littering on your property. For pet-friendly areas, one of the most important products you can incorporate into your space is a pet waste dispenser. By providing your users with a means of cleaning up after their pets, you spare other visitors from the unsightly mess, and still can provide a pet-friendly area for the enjoyment of your patrons. Smokers will also appreciate easy access to cigarette urns. While ashes and butts don't usually present a hazard, if your region has drier climates or drier seasons, they do present a fire hazard. 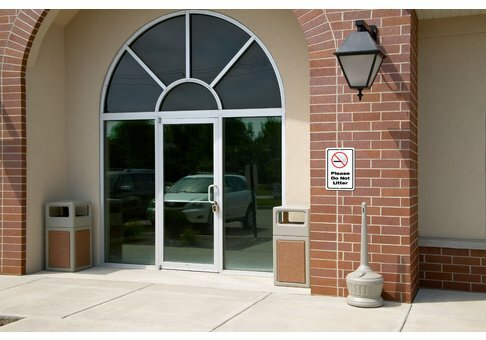 Providing cigarette urns is a small touch which will win smoking patrons over while preventing littering and fire hazards on your property. While providing waste receptacles may not eliminate all littering problems, having easy access to trash cans can make all the difference in the beauty and functionality of your space.